In 1905, construction of the Immigration Station began in the area then known as North Garrison. Surrounded by public controversy from its inception, the station was finally put into partial operation in 1910. It was designed to process Chinese immigrants whose entry was restricted by the Chinese Exclusion Law of 1882. A rush of immigrants from Europe were expected with the opening of the Panama Canal, but international events after 1914, including the outbreak of World War I, cancelled the expected rush, but Asians continued to arrive on the West Coast and to go through immigration procedures. 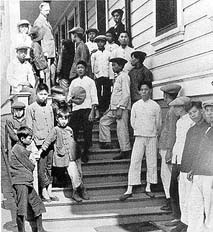 Though most immigrants processed through the Immigration Station on Angel Island were Chinese, over 80 countries were represented by the influx of immigrants. The influx of Asians into the United States, dating from the California Gold Rush, created tension between many immigrant groups. During the 1870s, an economic downturn resulted in serious unemployment problems, and led to outcries against Asian immigrants who would work for low wages, this along with the resentment towards Chinese who were finding themselves successful in the laundry, hotel and fishing industries led to very restrictive immigration laws. These laws allowed entry only to those that had been born in the U.S. or had husbands or fathers who were citizens. Enforcement of those laws was assigned to the Bureau of Immigration. When it opened in 1910, the new detention facility on Angel Island was considered ideal because of its isolation. Access to and from the Island was very important to control and enforce the relatively new immigration laws and deal with the threat of disease from the many new people arriving daily to America. There were buildings to house and care for detainees, a pier, hospital, and regular boat service to the mainland. During the next 30 years, this was the point of entry for most of the approximately 175,000 Chinese immigrants who came to the United States. Most of them were detained on Angel Island for as little as two weeks or as much as six months. A few however, were forced to remain on the island for as much as two years. Interrogations could take a long time to complete, especially if witnesses for the immigrants lived in the eastern United States. Some detainees expressed their feelings in poetry that they carved into the wooden walls of the detention barracks. Others simply waited, hoping for a favorable response to their appeals, but fearing deportation. Many of the poems that were carved into the walls of the barracks are still legible today. 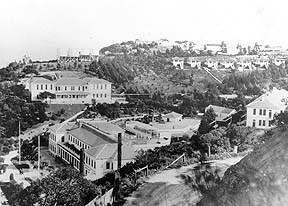 By the time the fire destroyed the Administration Building, immigration had slowed in the country, the government was finding that the maintenance of the facilities on Angel Island were extremely expensive, and finally as the U.S. entered WWII, China became an ally to the U.S. and immigration policies on the Chinese changed in response. In August of 1940, a fire destroyed the administration building and hastened the government's decision to abandon the Immigration Station. On November 5, the last group of about 200 immigrants (including about 150 Chinese) were transferred from Angel Island to temporary quarters in San Francisco.The Chinese Exclusion Act of 1882 and subsequent immigration laws were repealed with the passage of the Magnuson Act in 1943. Today, most visitors to Angel Island find the Immigration Station a place of reflection. While often called the Ellis Island of the West, the U.S. Immigration Station, was in fact quite different. Arrivals at Ellis Island were welcomed to this country by the near by Statue of Liberty and screened primarily for medical reasons leaving an average of 2-3 hours of arriving. At Angel Island, the objective was to exclude new arrivals, the memories of many returning visitors are therefore bittersweet. The Immigration Barracks has been restored to allow visitors a glimpse into the life of an immigrant, through recreated bunk rooms and recreation areas you can see the spaces immigrants lived while on their journey to a new life in America. Park staff and volunteers provide guided tours and interpretive talks to connect visitors today with the many issues and situations that immigrants faced on Angel Island over 100 years ago, and hopefully help visitors connect with their own family stories and the stories of immigrants today who, if you look closely, may be repeating history.